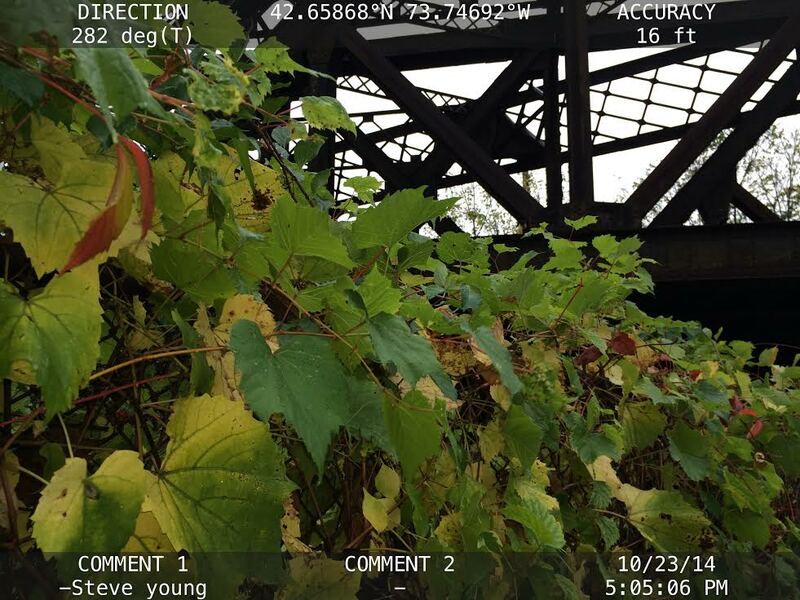 A relatively new app for the iPhone (sorry, no Android one yet), Context Camera is a great way to record the location, date, and time of the photos you take with the iPhone and have them displayed right on the photo. If you look at the latitude and longitude of the photo above of grape leaves you can see where I took it. Put put the coordinates into Google Maps with a negative sign in front of the longitude. The street view will show you the where the grape vines are. The app also shows the time of day, date, accuracy, and direction you are facing. There are two comment areas where you can enter up to 16 characters each. This is helpful for a plant name, collection number, collector, or anything else you can think of. I have been using it to record invasive plant locations I see and then using the info on the photo to enter an observation in the iMap invasives database at a later time, especially if I don’t have access to the database in the field on my phone. People have sent me photos with it so I can see where they have taken the picture. It’s a great tool for documentation and I highly recommend it for fieldwork. The location format can be set to many different styles including UTM. The accuracy depends on how good your phone is and where you are but so far my points have been close to the plants and accurate enough. Give it a try! I have found over the years that binoculars have become an indispensable part of botanizing for me. When I need to see plants that are inaccessible on foot or surveying an area by car, my binoculars let me see plants that I cannot get close to. Leaves high up in a tree, fruits way up on a vine, plants on a cliff, in the center of a deep marsh. All of these situations are helped by having a good pair of binoculars. If you turn them upside down and look the other way they can serve as a magnifying lens for looking at plant parts close-up. Take my advice and always have a pair of binoculars when you botanize. Oh yea, they are good for watching birds too. Naturalizing and Restoring Urban Gardens covers practice and theory to convert degraded urban greenspace into ecologically functional areas using native plant species and ecological principles. Students will learn the processes involved in planning and restoring naturalized areas, design, site planning and soil preparation, plant selection and maintenance. Individual courses can be taken for general interest or work towards one or both certificates. Program and course descriptions are available on the website www.UrbanHort.ca or contact info@coles.uoguelph.ca or 519-767-5000. The course will explore the structure, relationships, and identification of about 100 characteristic plants in 5 major wetland communities on the Shingle Shanty Preserve; ecology of dominant species; wetland structure and dynamics; climate change, acid deposition, and other conservation issues affecting wetlands. Jerry Jenkins is a researcher with the Wildlife Conservation Society that has over 40 years of experience as a field botanist, educator and researcher in the Northern Forest. He has authored and co‐authored numerous books, technical reports and field guides including Climate Change in the Adirondacks and The Adirondack Atlas. Instructor: Rick Van de Poll, Ph.D.
faculty at Plymouth State University. This letter and THIS CLICKABLE PDF FILE are about butternut (Juglans cinerea). We are providing them to keep you informed about what is happening with butternut and butternut-related research, especially at Hardwood Tree Improvement and Regeneration Center (HTIRC). HTIRC is research collaboration between the USDA Forest Service (Northern Research Station) and Purdue University (http://www.HTIRC.org). The PDF file contains a description of the mission of HTIRC with respect to butternut, some photos, descriptions of ongoing butternut research, and links to some butternut-related websites. Many hundreds of foresters, biologists, naturalists and landowners have contacted HTIRC over the past 10 years about butternut. I cannot thank you enough for your pictures and samples and other contributions to our work. I have only ‘met’ most of you by email after you contacted HTIRC. In some cases, your interest and willingness to help were so great that our staff and resources were overwhelmed by the volume of samples and requests. As a consequence, at times I didn’t reply to some inquiries in a timely manner or with all the data you requested. I am sorry for that, and I wish I had more time and resources to offer. Butternut canker is only one of many threats to the sustainability of the eastern hardwood forest, a resource we all value. At a time when funds are scarce, the best way forward is to communicate and cooperate. We do want to hear from you if you have thoughts about research priorities or research opportunities, or if you have resources that may help. There is no “Butternut Society” or other organized group especially for butternut recovery—at least none that I am aware of. So for now, we will do our best to keep you informed with periodic letters and updates to our website. There is much to do if we are to succeed in keeping butternut a vital part of the eastern hardwood forest. We improve our chances if we all pull together. We expect that updates about butternut will be provided on an occasional basis—certainly no more frequently than twice each year. Write to me at woeste@purdue.edu if you have any questions or need additional information. My complete contact information is below. Please share this information with anyone who you think will be interested in it. garden and arboretum as well as owner of numerous natural areas. that are open to the public. In place of the first two, we may include these recommendations from Mr.
meeting on Thursday June 23. For a registration form click on this link.